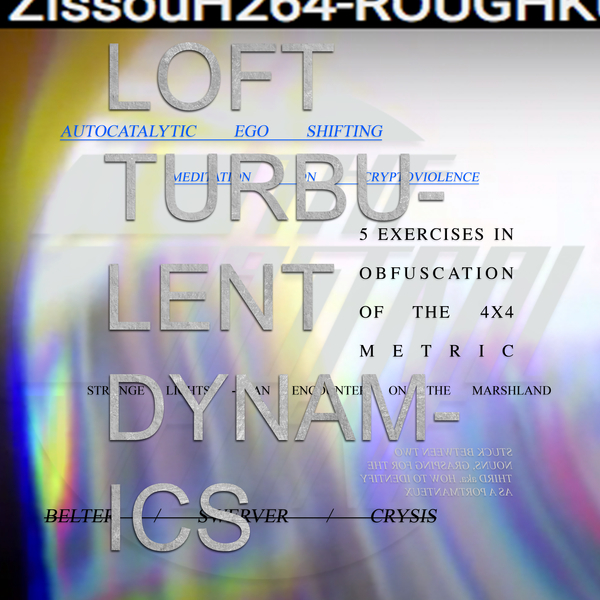 Astral Plane continue to absorb the brightest underground light with LOFT’s debut dispatch of brittle, nerve-riding rhythms and spatial awareness-baiting electronics in Turbulent Dynamics, which arrives strongly tipped to fans of Felicita, Why Be, TCF, Actress. Also known as Loftmind, LOFT ransacks from many styles to make a wicked racket for the most boisterous, deconstructed ‘floors and headphone dwellers who like to feel as though they’re in a gyroscope whilst sitting on the bus. From the top, the clattering, non-repetitive cadence of Yes makes a sly nod to TCF’s 1000 Snares before flipping out into noise chaos, before Zissou goes hard like RP Boo with a case of rictus knees, and Perimeter stalks zones of extreme frequency pressure akin to output from PTP. And then he locks it right off with the EP’s most dance-friendly number, Heffalump, providing one of the freshest, warped takes on Livity Sound or Female’s tribal techno that we’ve heard in a minute, and lets it all come crashing down with gloriously messy results in With Eye Contact.